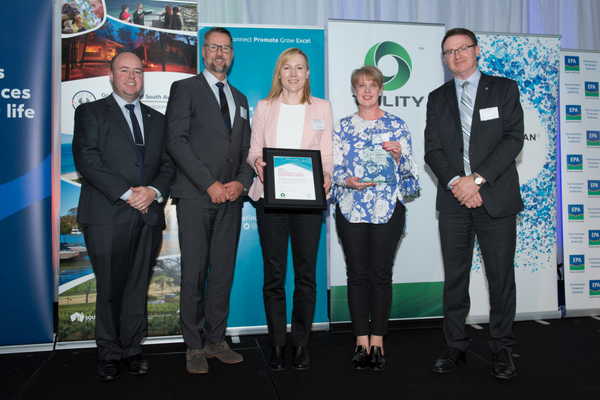 The South Australian based Australian Water Quality Centre (AWQC) was awarded the Innovation in Larger Organisations Award at the Ceremony on Friday July 6 for its Australian-first innovation Optimising water quality management utilising Next Generation Sequencing (NGS). NGS technology enables use of a simple water sample to determine what organisms, including vertebrates, native fish, and bacteria have been in contact with a water source. Two pieces of equipment in the AWQC’s Adelaide lab – the ION Chef and the ION S5 – create DNA chips and unique barcodes for organisms found in water source samples, providing more detailed and reliable information than any water quality lab in Australia has previously had access to. While similar technology is being used by hospitals across the country for cancer and genetics research, AWQC is the first in Australia to adopt this technology for water quality management. “This is leading-edge technology and the AWQC has been the first laboratory to apply it to the water industry,” AWQC’s Senior Manager Laboratory Services, Karen Simpson, said. “It’s a ground-breaking means of being able to test water and determine contaminants. “We’re pleased we’ve been able to work with SA Water and other customers to develop this technology for the water industry. The equipment is currently helping to detect good bacteria in samples from SA Water’s Glenelg and Christies Beach Wastewater Treatment Plants, which is used to enhance the treatment of sewage before it’s recycled or goes out to sea. AWQC’s technique is also being further developed to enable improved analysis of a wider range of organisms, including aquatic insects and algae, in water sources such as the River Murray. The AWQC team accept the Innovation in Larger OrganisationsAward at the 2018 Smart Water Awards.